Below is the talk from our #4C16 panel (April 2016). Link to slides too. We want to start by getting some misconceptions out of the way. Our large-enrollment composition course was not occasioned by institutional pressures, not budget, not bottlenecks, not faculty shortages. It is not a scaled-up version of regular composition and does not take part in neoliberal projects of scaling for fiduciary efficiency. Instead it was from the outset a design for better learning, better instruction, that emerged from an “entanglement” of the institutional environment and intentional innovation. Particularly germane to the institutional “environment” are three programs that interact with the jumbo: The Educational Opportunity Program (EOP), the First Year Experience program, and our composition program’s forty-year history of using students as writing mentors. The innovation was to create a large-enrollment academic writing course, usually around 90 students, that meets for one hour two times a week. In the large class, students are supported by 9-10 mentors, upper-division English Education majors or graduate students in Language and Literacy advising track. These mentors also meet with the students in a workshop (usually 9-10 students) for two hours on Thursdays or Fridays. The jumbo in both qualitative and quantitative measures is a success. Students achieve, get good grades (98% pass rate), enthuse about the course. Professors, speaking especially about ourselves, are equally enthusiastic about the course, witnessing engaged learning and high achieving students. There is a lot to think about in this model: the education and use of mentors, the role of the instructor, the structures of the workshop, a public event at the end, and the curriculum (which we will talk about only briefly). But today we want to tackle head-on, to explain, to theorize, why the central difference—the high number of students—makes this course a better learning environment than our regular composition courses. The primacy of the teacher and student dyad and the classroom as closed container fades in the jumbo and is replaced by a network: encounters and entanglements with other students, with mentors and professors, and with other university professionals, inside and outside the jumbo. This network, formed by EOP, reformed again in a First-Year Experience and a courselink that follows, and again in the structures of the mentors and workshops becomes epic and viral. The concept of “epic” we take from Jane McGonigal’s Reality is Broken. Epic happens when participants in a project realize that the projects and actions they engage in and environments where they take place seem “bigger than ourselves” (98). “Epic” projects provide contexts for action as a form of service to these larger goals, encourage wholehearted participation, and—perhaps most relevant to our goals—provide mechanisms for the exchange of expertise. When systems are designed to help people share their interests and goals, she argues, people can be called upon and are motivated to do work they excel at. “And the chance to do something you’re good at as part of a larger project helps students build real self-esteem among their peers,” McGonigal says, “Not empty self-esteem based on nothing other than wanting to feel good about yourself, but actual respect and high regard based on contributions you’ve made” (130-31). The realization of competence, the offering of contributions from the students creates a swarm that generates not just a single identity, but a collection of identities driven by the desire to be scholars, to find out things, and to share their findings with colleagues. The embeddedness in local institutional context makes the jumbo nonscalable. We take our understanding of scalability from Anna Tsing’s remarkable article, “On Nonscalability:The Living World Is Not Amenable to Precision-Nested Scales,” where she argues that the understanding of scaling—the movement of a project from one context to another with little change to the original (think McDonalds, Starbucks) is an underexamined concept. Tsing shows that scaled projects are a capitalist fantasy, always transform themselves and their new contexts as they move, often by destroying environments, cultures, and people. Scaling, a process through capitalist projects (say “Composition”) are reproduced in ever expanding contexts with little or no change to the original. Though there’s an argument that the Harvard model of composition is exactly that fantasy, that’s for another paper. We use Tsing’s ideas to counter the argument that our jumbo is a “scaled expansion” of Composition and argue that the learning we offer is about the richness of nonscalability. Composition as a scaled project at CSU, Chico has fairly routine results: creeping class size, two or three or even four tiered staffing systems, varied degrees of knowledgeable instructors, widely varied approaches and purposes for the class. While we have done the regular things to counter these problems (common outcomes, professional development meetings, etc), mostly we’ve come to think that this is the imperfect world we live in. We began to question the high value placed on the role of the instructor to drive the composing processes of students, wondering if the emphasis placed on extensive feedback by one authority, for example, is the best means for supporting writers. These questions became especially acute when we realized that in 2007 close to 40% of EOP students were failing the first-year composition course (as compared to our non-EOP students whose fail rate was closer to 10%). Shortly after, Jaxon and colleagues instigated a series of structural changes, including a series of mentor-supported writing intensive activities nested within a redesigned sequence of courses. Jaxon and colleagues’ success in the Summer Bridge program occurred because of the healthy exchange of ideas and practices between the EOP staff and writing faculty. One feature of Summer Bridge stood out: the 200 students talked, listened, interacted, joked, shared, learned, and supported each other to a degree that is uncommon in the usual institutional contexts. There was a palpable energy in the space as this large number of students worked side by side supporting the writing of their peers. So Jaxon wondered, what if it were possible to replicate the “epic” sense that she observed in the Summer Bridge program in first-year composition and mesh it with what we know about how writers work? In the world, writing circulates across networks, platforms, readers, and critics: we are interested in the ways in which a large class can approximate complex systems of production and circulation (Trimbur, 2000). So that’s good. What’s the advantage of putting them all in one room? Why are bigger numbers better? Let’s step back and make visible a contrast between the jumbo experience and the educational histories of our students. Many come from an NCLB-scarred educational environment where writing–and any other unmeasurable practice–was pushed out of the curriculum, where the students take, on average, twelve different standardized tests each year (Strauss). They enter the CSU system, take a bizarre test that nearly all of the EOP students fail, have to do (and pay for) “early start,” a ridiculous initiative that requires students begin remediation after they are accepted and before they are enrolled. Though these alienating experiences produce a wise skepticism about education, students still hope that “college” will somehow be different. It is this latent hope—hope represented by the human characteristic of curiosity that drives learning—that is nurtured by the iterative structures that students inhabit at Chico. What drives the energy of the jumbo is the number. Tony Sampson, in his book Virality: Contagion in the Age of Networks, cites a Stanley Milgram experiment: If one person looks up at the sky, 20% of passerbys also look up at the sky. If five people look up at the sky, 80% of passerbys look up at the sky. Sampson comments, “the individual makes a contagious assumption based on the quantity (my emphasis) of evidence that there is something worth looking up at” (51). In a similar way, the quantity of students who embrace the jumbo increase the virality of the experience. This explains the high pass rate and the general “this is worth my time” attitude of the students. Students enter a space that offers complex and extended attention to multiple ways to participate. A question driving our design is “What ways of doing, what identities are offered, supported, and celebrated?” We hope to extend a sense of self like that of a “successful college student” to something deeper: an identity as a scholar and member of a team of scholars. We argue that the large class affords the construction of a scholarly identity, an identity we think was always already there, but untapped and unnoticed. The students are recognized as scholars, thinkers, writers and this recognition comes from relationships they value, from their mentors, the faculty, but more importantly, from their large number of peers. The structures of the jumbo makes sustained contact among students possible: they coalesce around commonalities of academic work, success for themselves, and their families. These commonalities are overdetermined, or multicreated, by the EOP, shared desires of economic mobility, our mentors, and ourselves. The “flow of desire” is about academic success, the realization of an identity of a smart person, a scholar, a researcher. The virality of the jumbo emerges from this mix of spontaneous encounters, designed social spaces, and shared desires. An iterative social practice in the jumbo is to model and create noticing. We were concerned at first, at the possibility of students feeling lost in the numbers. That has not proved to be a problem: routines in the classroom set up noticing. We create structures—small teams, public blogs, consistent exchanges of student work, featured work—which model and support noticing. The experience of being noticed, either by the professor, the mentor or a peer, in a class of nearly 100 is more powerful than being noticed in a class of 20. As an example of one structure that supports, and more importantly, makes noticeable, the scholarly work of students, we ask students to participate in a “Review Board.” Each workshop team sends a representative to meet with the instructor for an hour outside of class time each week. The Review Board is responsible for reading the work of their peers and nominating a writer to be featured in class. We end up with nine featured writers—one from each workshop—and we pick a few to talk about in the large class. The review board’s job—back in the large class—is to present the writing, talk about why they think it represents some of the best thinking that week, pose questions to the featured writer about her choices, and celebrate their peers. We are impressed by this small Review Board team: without prompting they will often ask “what was the purpose of the writing this week?” Or they will say, “we featured her work last week; we should make sure someone else is featured.” The students recognize that the writing is intentional and that we value the ideas from as many students as possible in our class. Each week, a new batch of scholars emerge and are highlighted in our space—and over time—we build a community where the students are noticed. Pedagogical practices such as this—the curation and publication of classmate’s work by classmates—contribute to students being entangled in each other’s work, creating contagion where students pursue inquiries of their own design, inquiries that matter to them and begin to matter to their classmates as well. It’s the collective force—the numbers—that make this powerful. What activities and structures are better with more people? What classroom practices support noticing and being noticed? How can you redistribute labor in equitable and effective ways to provide students with response, with people to think with, with notetakers and record-keepers? What technologies work better with larger numbers? McGonigal, Jane. Reality is Broken: Why Games Make Us Better and How They Can Change the World. New York, NY: Penguin Press, 2011. Sampson, Tony. Virality: Contagion in the Age of Networks. Minneapolis, MN: Univ Of Minnesota Press, 2012. Trimbur, John. “Composition and the Circulation of Writing.” College Composition & Communication. 52.2 (Dec 2000): 188-219. Tsing, Anna. “On Nonscalability: The Living World Is Not Amenable to Precision-Nested Scales.” Common Knowledge 18.3 (August 2012): 505-524. I just finished course design for the fall 2015 semester. If you were to shine a flashlight into this world every August, you would find me on a couch in the living room, hair disheveled, clothes unchanged for days, various food products tossed to the floor, and surrounded by books ranging from Vygotsky’s Mind in Society to Scieszka and Barnett’s Battle Bunny. I love this time of year. And once I get started on prep, it is almost impossible to stop. For me, imagining a learning environment, curating the texts, and designing for community and participation is like playing a great platform video game. Each course becomes a puzzle to solve as I imagine students inhabiting this world I’m trying to build. And I know–and hope–that they’ll take the world as it’s designed and mess it up. They’ll mess it up in all the best possible ways. Imagining the course without students is actually easy…and tidy. The class is so clear in my head: what we’ll read, how we’ll talk about it, what students will make. And then other humans come in the room, and in most semesters, students do things and make things that I could not have imagined. And I learn. And we learn. What I learn mostly is that I have to be willing to let go of my favorite things I’ve designed for the course. I have to let students remix, mashup, and throw out our plans: their questions must drive the course even if we meander at times. I appreciate the struggle that comes from designing a course where it is safe to fail. Where failure is valued, not because “anything goes,” but because we are thinking through such complicated ideas we could not possibly solve them. Multimodal-ing. I want to get clear(er) about multimodal composing: the whys, what assignments do, how to assess, how to give feedback, etc. I’ve been re-reading Gunther Kress and diving deep into Shipka’s recent work. 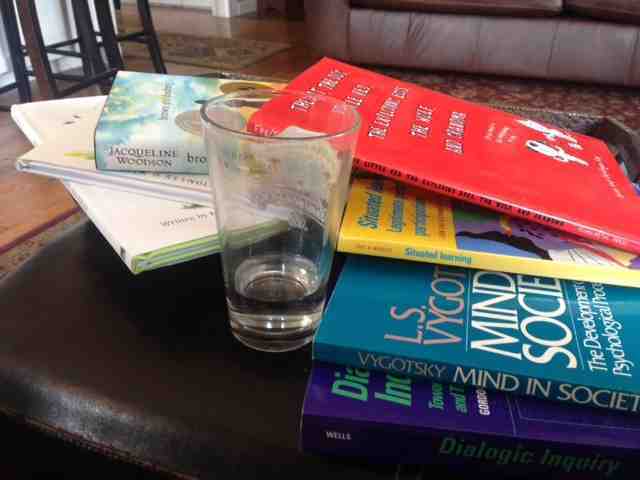 Reading list is in process and a plan to gather a group of colleagues to read together. Coding. I want to learn more. As I argue for an open web, I feel limited in my understanding of the structures of the web. My plan: time with Code Academy. Writing. Leslie Atkins, Irene Salter, and myself signed a book contract with Teachers College Press. Our book–Composing Science: A Facilitator’s Guide to Writing in the Inquiry Classroom–aims to provide research and support for teaching writing in the science classroom, particularly in higher education. We would like students to experience writing practices that mirror the practices of scientists (so, no lab reports). We are super excited to be working with all we’ve learned from our NSF grant and the last couple of years we’ve spent teaching and researching together. My plan: level up in my writing with more precise arguments. We have beautiful student data to work with and I’d like to do it justice. Opening. I started a commitment last fall, after the DML work, to open up my class and make connections outside our space. I want to connect students to communities of practice they hope to join. I started by connecting with an amazing teacher, Wendy Fairon, and asking my future teachers to blog with Wendy’s 7th graders. The two populations of students blew us away with the connections they made to each other and to young adult novels. I’m hoping to continue this work with Wendy and with a teacher from Redding. I’ll also pair students–as peer response buddies (like a pen pal)–across sections. I’ve found that this outside audience is great for our blogs. I’m constantly in search of ways to connect my students to other authors, students, and fellow faculty. Love the fresh start in fall. Let’s do this. In this project I decided to look at the literacy in legal discourse. Specifically at the translation that occurs between the police reports and the court room. What you will see in these posts is an interview with Mike Ramsey, Butte County’s District Attorney, and Rick West, Butte County’s assistant District Attorney. In this interview we discuss the structure of narrative and language is used to construct these narratives to present them to specific audiences. Like the police report that is presented to the DA and the court case that is presented to a jury. What you will hear in this first series of questions is how the DA works with police reports to create a story that is presented in a language that jury will understand. An interesting notion that is discussed in this portion of the interview is the idea of “cop shows”. The audience is expecting to hear language that is presented in media, the seem to be mixing the fiction narrative with the real life narrative. As DA Ramsey explains even the police are attempting to adopt this language. In reverse of this perspective that the DA’s office has been trying to get the cops to use more common language in narration rather than the “cop talk”. This piece of the interview is discussing the translation that is necessary for the narrative to be conveyed to the general public. It is interesting to think about the details of language that are considered in the DA’s presentation of the narrative. Such as Ramsey’s reference to pronouns and West’s reference to making the language in the police report more choppy but clearer in the reference of “who” in the report. This part of interview progress to the use of evidence and how it plays a role in the construction and presentation of the narrative. What is interesting about this idea of evidence is that language still plays a huge role in its impact. The evidence supports the narrative but also propels the narrative. The initial presentation of the story is crucial to success and use of any further support of the story. The conversation of evidence continues in this section talking more specifically about pieces of evidence and their use in the courtroom. Something that is interesting about the position of the investigator is that he or she seems to play a crucial role in the translation of the story. They work with all the different avenues of narrative in order to help to construct the story. Continuation of the use of an investigator and evidence in the courtroom. Ramsey’s idea of active listening and being part of the narrative that is occurring in the courtroom is essential to perpetuation of the constructed narrative that they are attempting to present. Acknowledging that there is a difference between the case that is being presented and the progression of events that are occurring in the court room. I love the door story as a great example of use of evidence in the court room. We discuss further the importance of timing and presentation of evidence in cases such as the door. Evidence can only come in with a witness, the evidence only has its place if a witness can put it in the crime. Which is interesting in the idea of narrative and literacy because the evidence’s effectiveness is based on its relationship to the human element of the crime or the case, which in many ways makes it a constant in a variable. The story of the object cannot change but the language and the person surrounding it can. In this section we discuss how the DA progresses through a questioning sequence and how they account for the changes that can occur in that sequencing the court room. This relates back to the earlier idea of active listening. The person doing the questioning as to actively listen to the narrative that being constructed in comparison to the one they have built to be presented. And, then have to ask questions that can keep them on track with the narrative they are trying tell versus the one that is being told. This section we talk about witnesses and how they tell their stories in the court room. This piece reminds me of learning to work with different personalities. Learning to account for the human element in telling and constructing a narrative is challenging and unpredictable. Which makes these narrative constructions so interesting because the solely based on human interaction, court cases are based upon the wrongs or disagreements that occur between people. Some ending thoughts. I had a lot of fun doing these interviews and talking through how these narratives can be presented in court. I would like to research further the role of the investigator because they seem to play crucial role in how the stories are translated and told. I have also included the complete interview here at the end, there are couple pieces that I did not include for the sake of length and relevance but I still found them interesting and if listen to them I hope you do too. Ramsey and West further discuss the role of the witness and creditability to can be established. In this idea of credibility we also discussed some of the aspects of child crimes and children as witnesses. For my project I am looking at some of the language used in law enforcement specifically at how language is used by the DA to construct a story. I have conducted an interview and I a now beginning the process of listening to my interview and breaking it up into pieces that will be put on a blog with both written and audio components. When I first started this book I was lost. It took a couple of reads to understand what was going on however, the more that I got into the book I began to realize that this might have been the intention of the author. Since the two main characters are failing though the sky in a kind of chaos, the characters are not a hundred percent sure what is going on, and the reader kind of feels the same way as they attempt to navigate through the text. Nonetheless, once I got my bearings a little in the text there were some interesting analogies that caught my attention. While I expected the religious analogies I did not expect the references made to childhood fairly tales such as Alice in Wonderland, Peter Pan and The Wizard of Oz. What is interesting about these tales is that they are all very fantastical and operate predominantly in an alternate world or reality. Which fits the beginning of the book and the fall from the plane crash, realistically it would be virtually impossible for someone to survive a fall like that and therefore, the reader must suspend reality in order to believe that this is possible. There is also a relationship to the idea of the world that these actors live in, the person they portray either in reality or on screen seem to be polar opposites of each other. They are not who they appear to be which also questions reality.